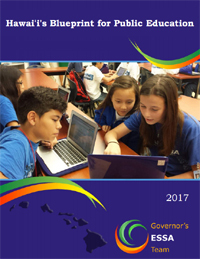 Every year, the City and County of Honolulu awards a minimum of $2.25 million to grantees through the Grants in Aid fund, which was created in 2012 by Section 9-205 of the Revised Charter of Honolulu. It is funded by a minimum of one-half of one percent of the estimated general fund revenues, and allocates no less than $250,000 for each of the nine City Council districts. In 2017, the State Legislature awarded $7.45 million to 26 grantees through the Grants in Aid fund. Under Hawaii Revised Statutes, Chapter 42F, the Hawaii State Legislature can award grants for capital improvement projects and operating funds to support programs. I supported the Grants in Aid (GIA) programs because I wanted my tax money to go to worthwhile causes. I believe that local nonprofits can address needs that government can’t meet. In general, I trust local nonprofits to be more effective than government at helping those who need help, because they are closer to community problems. But I think it’s time to discuss suspending the GIA programs. By suspending the GIA programs, we could redirect $10 million, plus GIA administration staff and expenses, towards existing government programs. We desperately need money to fund basic city and state services. In addition to essential services, repairs, and improvements, Honolulu continues to face a crisis in rail transit funding, raising motor vehicle registration fees, fuel taxes, parking rates, and possibly property taxes. The State of Hawaii has ballooning expenses of its own, and has been considering raising the transient accommodations tax (TAT) on visitors. Government funds could still subsidize nonprofits that are filling a gap in services, supplementing existing government programs. But government may not be able to fund nonprofits that are not closely aligned to current government responsibilities and commitments. More than ever, nonprofit organizations need to be financially stable without government support. And communities need to make hard decisions about which nonprofits to support. Should we continue to support the Grants in Aid funds? Should the grant money be used instead for existing government programs? What would be the impact on the community if we suspended the Grants in Aid funds? I love superhero movies. I enjoy the extraordinary superpowers (I would choose telekinesis as my power), the fight for justice, and the struggle of good vs. evil. And I revel in the movie “Wonder Woman” (2017), with its blend of sword-fighting, optimism, and humor. Diana (Wonder Woman) is a role model and inspiration for our times. chooses to be part of the world, instead of keeping separate from it in a Fortress or Tower. She takes a stand when she sees suffering and wrong-doing, instead of waiting for someone else to take action. She chooses to believe that people can be strong and capable, instead of weak and misguided. We need more Wonder Women in the world, and we have to find her in ourselves. 1. Choose your future. We can challenge and improve ourselves in ways that don’t hurt anyone else. Though Queen Hippolyta forbids the young Diana to train as a warrior, Diana chooses to become a warrior anyway. Diana doesn’t want to be coddled or protected; she wants to belong in Amazon society and she wants to have a purpose in life. 2. Value the truth. We can make important decisions based on the most accurate information at the time, instead of relying on emotion or opinion. The Amazons use the Lasso of Truth to question Steve Trevor, instead of killing him outright. Bound by the lasso, Steve cannot tell a lie, and in fact is compelled to tell the truth. Only then do the Amazons – and Diana – decide how to act. 3. Believe that people are worth saving. We can choose to help people because that is who we are, whether they deserve it or not. In many superhero movies, humans are either villains or innocent by-standers, but we rarely see them as complex or flawed. At first, Diana believes in the innate goodness of humans. Later, when she sees that humans can choose to be evil, and wonders if they deserve to be saved, Steve reminds her that “It’s not about ‘deserve.’ It’s about what you believe.” Wonder Woman believes in us. 4. Lead from the front. We can be role models, inspiring others to challenge themselves or fight for a cause. For most superheroes, humans are only there to be rescued or to act as a support team. Diana does not prevent others from fighting for what they believe in. She trusts humans to fight beside her, acknowledging their strength and integrity, because she knows that she can’t do it alone and it is everyone’s fight. 5. Make the world better. We can take a stand when we see suffering and wrong-doing. Time and again, Diana takes action when people tell her that it is not her fight, that she doesn’t have a voice in the discussion, that she is only one person against an army. And when she is told that she needs to ignore the suffering of the people right in front of her and focus on the biggest threats, Diana proves that you can make things better for individuals and society. 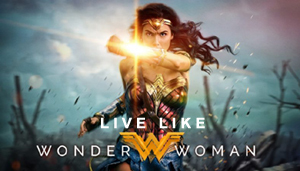 How do you live like Wonder Woman? 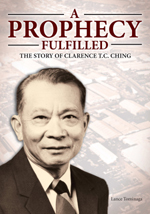 I didn’t realize his fragile beginning, the pressure to succeed, or the scope of his legacy until I read “A Prophecy Fulfilled: The Story of Clarence T.C. Ching” (2009) by a biography commissioned by The Clarence T.C. Foundation and written by writer Lance Tominaga. Ching helped his own family and also had lasting impact on Hawaii communities. In this short biography, we see glimpses of his personal and business life. Clarence Thing Chock Ching (1912-1985) was born in Anahola, Kauai to Ching Hook and Hee Kam Sing. He was raised on Confucianist ideals of loving others, which was reinforced by the Christian ideal of charity. He was a champion boxer and graduated from St. Louis School in 1932. He married Dorothy “Dot” Sau Pung Tom, and raised three children. I would have liked to read more personal anecdotes about Ching and his life in his own words, but we do learn that he was modest, unassuming, generous, visionary, and led with quiet decisiveness. He did not need to take credit for his philanthropy. He shared his wealth with his 10 siblings and his wife’s 9 siblings, and he shared his time and thoughtfulness with Governor John A. Burns and nonprofit boards like St. Francis Medical Center, St. Louis School, and Chaminade University. In business, he was an astute risk-taker who dreamed big and kept his word. In 1956, Ching and his business partner Kan Jung Luke purchased Damon Tract in Kaloaloa for $4.5 million, and in 1957 he bought the ahupua‘a of Moanalua from Sam Damon for $9 million with a handshake deal. He helped develop affordable housing (Moanalua Hillside Apartments, Moanalua Gardens, Lakeside, Kukui Gardens), envisioned Honolulu Country Club, co-founded Hawaii National Bank in 1060, was a driving force behind Chinese Cultural Plaza, and had the foresight to recommend St. Francis Medical Center West (now Hawaii Medical Center West) in Leeward, rather than Pearl City. In fact, Ching’s philanthropy and generosity touched my life in ways that I didn’t know before. My husband grew up in Kukui Gardens and ate at restaurants in the Chinese Cultural Plaza, and his parents purchased an apartment in Moanalua, along the Honolulu Country Club. Honolulu would be a very different place today without his influence, vision, and open-heartedness. You are currently browsing the Better Hawaii weblog archives for July 2017.